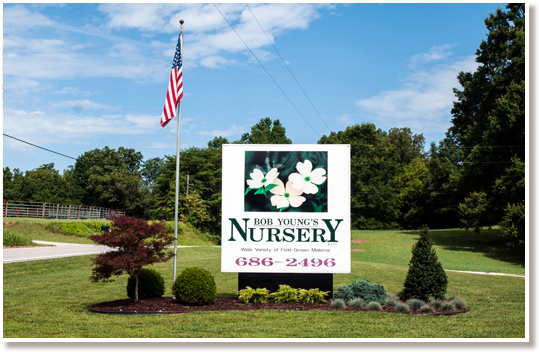 Bob Young's Nursery is a third generation, family owned business, located in Rock Island, TN. Bob Young, Sr. started in the mid-70's by growing dogwood seedlings and selling to the local nurseries. In the late 70's, Bob Young Jr. started lining out stock and producing balled & burlap material for the local nurseries. And, in 1986 Bob Young, Jr. was ready to take the business to another level. He named the business Bob Young's Nursery and started attending trade shows, selling his product to landscapers, garden centers, and re-wholesale nurseries. In the early 90's , son Chris got involved in the nursery. He brought more ideas, growing practices and continues to add a broader variety to the mix. By 2000, the business had grown from a few acres to 200+ acres. Today, Bob Young's Nursery has expanded to approximately 400 acres- spread across some of the best fertile land in Warren County. Over the years, Bob Young's has put more emphasis on the quality and service for their customers by providing plant material from bare root to 4" + caliper trees to match the changing needs. The dogwood is their specialty and has been their best seller for the past several years. Bob Young's currently offers over 10 varieties of dogwoods and continues to add new varieties for the near future. All of the balled & burlap plants are hand selected by Chris Young providing you with the best plants possible. "Our number one goal is to produce the best quality, grade, & service to our customers. It is the customers who have put us where we are today! We are very proud to offer the variety and quality of our stock to you. We invite you to come by and look for yourself." Thank you, from all of us at Bob Young's Nursery.